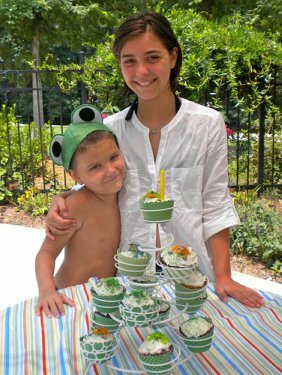 A frog birthday party made this six year old a "hoppy" boy. 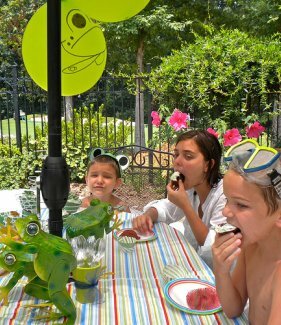 With bright green frogs for centerpieces and frog leaps into the pool, this kids pool party idea gave lots of opportunity for creative invites, party decorations and games. The birthday boy kept his frog hat on for almost the entire party. He loved being the birthday boy and we loved watching him and his brothers enjoy a fun filled afternoon at the pool. Watch this video for inspiration - it will surely leave you with a smile. What do frogs and kids pool parties have in common? They both love the water. Would you believe a real frog decided he wanted to attend as well? He even hopped into the deep end of the pool where we had to go on a diving rescue mission to get him out. 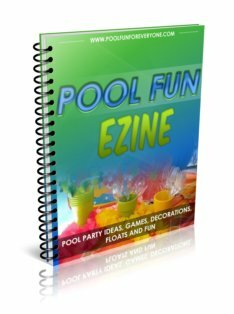 By giving your pool party a theme - colors, games, decorations and party favors all come together. 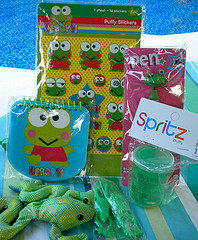 Frog party supplies can be as simple as green colored paper goods, party bags with green frog cut-outs and lots of green balloons. 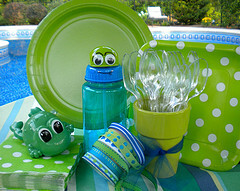 Simply use lots of bright green colors for the napkins, plates, vinyl tablecloth, and cups. These boys enjoyed the frog toys and games way more than any special paper goods. 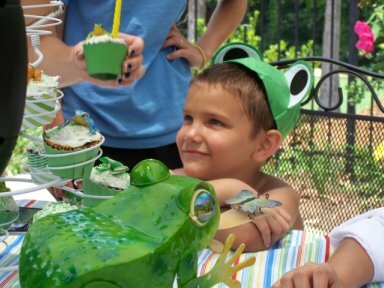 Provide the guests or at least the birthday boy with a frog hat or frog visor. I found both at our local dollar store. 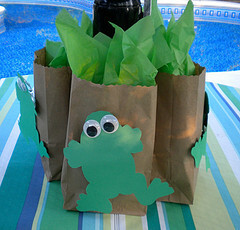 Party favor bags were made using a brown lunch bag with a "hoppy" frog on the front. 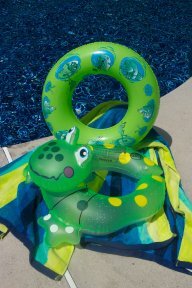 We like to spend our party money on items that bring fun to the party - like frog swim rings, squirters, and floats. 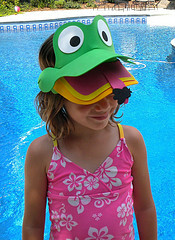 Be sure to get a frog foam visor or frog hat for the special birthday person. However, they are not easy to find. If there had been more I would have bought one for every child. Anyway, because it was made of foam, the birthday girl enjoyed wearing it in and out of the swimming pool. I love how there are themed beach balls for any type of pool party. 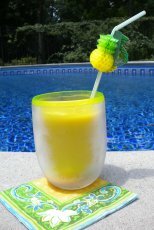 Use the inflatable frog beach balls for pool decorations, party favors and for some plain fun in the pool. Have the balls floating in the pool when the guests arrive. To get everyone into the pool instruct the guests to go find the frog beach ball with their name written on it - if they are old enough to read. Otherwise - tell them to go get their beach balls for a fun game. Use lots of green balloons with frog faces. Hang them from tree branches and the ribs of your patio umbrella. Let your party bags serve double duty as your centerpiece. 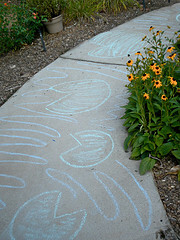 Chalk drawn lily pads on the sidewalk get the guests "hopping" right down to the pool. This friendly frog was clearance item at Oriental Trading originally used for a VBS series. 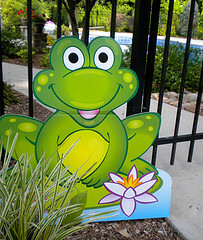 Often items can be re-purposed for your pool party like we did with Mr. Frog. 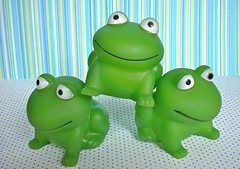 Aren't these cute frog party decorations? It's a long story as to how I inherited these cute green frogs, but they made for perfect centerpieces for our frog birthday party. The birthday boy kept his frog hat on even when he was in the pool. The colorful striped vinyl umbrella tablecloth covered the two patio tables. Our frog birthday party turned into a "hopping" good time. This large cardboard frog was on clearance from Oriental Trading. He greeted the guests at the pool gate. Chalk drawn lily pads decorated the sidewalk to the pool. The kids jumped from lily pad to lily pad until they reached the pool. Mr. Frog hung from the garden arbor, another clearance item from Oriental trading in their Vacation Bible School section. Blow up lots of green balloons and draw a frog face on each balloon. Hang them from tree branches and the umbrella ribs of your patio umbrella. 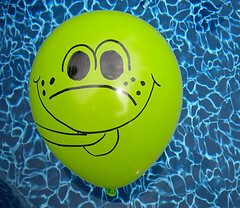 We also had a dozen of the green balloons with frog faces floating in the pool for kids pool party games. My niece helped make these colorful, frog party bags that served as table centerpieces as well. With bright green construction paper and big googley eyes these fun, green frogs were attached to the brown paper lunch bag with a little strip of accordion paper. 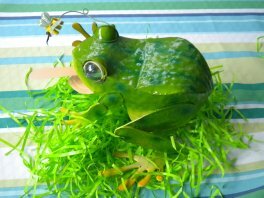 The green frogs had a little bounce and spring to them which also gave a three dimensional look. Using a simple frog template and some green construction paper, the frog party bags were made from inexpensive brown lunch bags. Trim the top using a decorative scissor. Stick on large googley eyes and place the frogs at an angle on the bag. Insert bright lime green tissue paper in the bags. 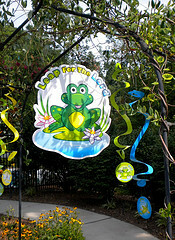 The party bags served double duty as frog decorations by placing them around the umbrella pole of the patio tables. Some ideas for frog birthday party favors are frog bouncing balls, stickers, notepads, pens, frog visors, and frog temporary tattoos. Green slime is also a cool party favor for a frog birthday party. 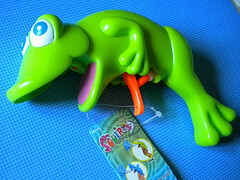 Frog squirt guns were found at K-Mart at the beginning of the summer. Use the squirt guns for games and party favors. Our dollar store had frog splash balls that we used for games and party favors. Who says you need party bags as part of your frog party supplies? 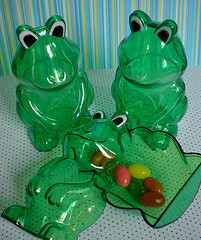 Why not fill these cute frog shaped containers with jelly beans or gummy bears or stickers? These containers were found at Easter time with the Easter eggs at K-Mart. I knew that I had to have them for our Bullfrogs and Butterflies party this summer. 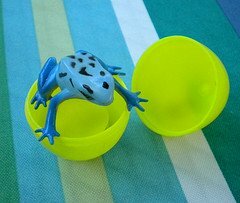 Use them for a frog party game like a scavenger hunt instead of as take home favors. For kids pool parties, I like to keep the party supplies water proof. These frog squirters are sooo cute. 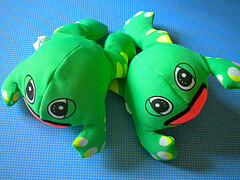 Use the squirters for frog games, frog party favors or placed on the party table for frog decorations. The key to finding good party supplies is to determine your pool party theme and to plan ahead. These frog squirt guns were a lucky find at K-Mart. I have seen them at Target too. Purchase enough so that each guest has their own gun. You can put them in the party bags or hand them out already filled when the guests arrive to start some wet fun. Need some fun frog games for your Frog Pool Party? 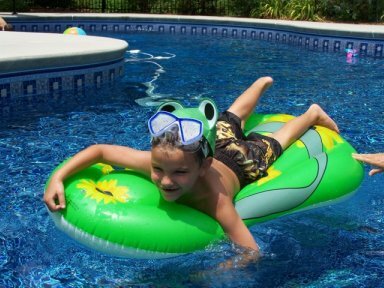 Lilly Pad Leap, frog splash bombs and frog balloons will keep kids in the pool having fun. 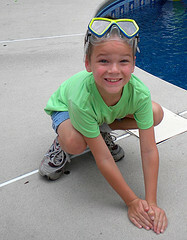 Start by getting two frog swim rings to use for races and splashing around in the pool. Simply divide the guests into two teams. Each team is given a frog swim ring. One team member from each team races against the other team member across the pool. Determine if it should be the lenghth or the width of the pool depending on the swimming ability of the children. The team who finishes first wins. 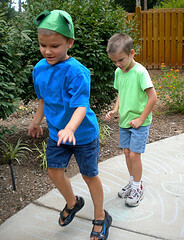 Draw lily pads using bright green chalk on the sidewalk leading to the pool. Do a big circle with a pie shaped piece missing to look like a lily pad. We greeted the birthday boy with his own special frog hat. The kids enjoyed hopping from one lily pad to the other all the way to the swimming pool. See how much more fun a themed pool party can be? Use water bouncers for some fun free time as the kids bounce the frog to each other on top of the water. As you can see the birthday boy loved his frog hat and played the part when he exclaimed to us that he was floating on the pond on his own lily pad which is really a green flip flop float. Our green air mattress became a ride on the lily pad and frogs were discovered on the bottom of the pool inside the dive eggs. Start the party with temporary frog tattoos. They are easy to put on. 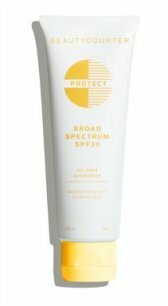 Simply remove the protective sheet and place the tattoo on the arm. Hold a wet washcloth on it for about 10 - 20 seconds until the design transfers. 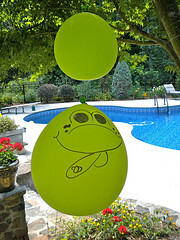 Frog beach balls make great pool party decorations, party favors and pool toys. Have half of them floating in the pool when the guests arrive and use the others for party decorations. To get everyone into the pool instruct the guests to find their ball with their name written on it. Pool party games take on new life when given a theme. The party guests and especially the birthday boy loved this timeless theme as they hopped around like frogs, chased real frogs, and enjoyed their frog party favors. We use these dive eggs at just about every party. For this themed party, we put in little plastic frogs. Depending on the age and ability of the guests place the eggs at a depth and distance that is comfortable. The kids took turns diving for one egg at a time. The frog inside the egg became their take home favor. After they took out their frog, they loved playing the game over and over. It helps to have a creative niece to draw these cute frog faces on lime green balloons. The balloons were used as frog decorations hanging from tree branches and the patio umbrella ribs. But the kids had the most fun playing with them in the pool. Provide each guest with their own frog balloon. Simply see who can keep their balloon in the air the longest. Make a couple of extras since sometimes they pop unexpectedly. 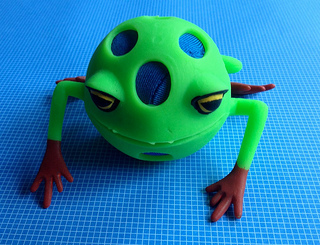 Frog splash bombs can be used for free time play or incorporate them into your frog games. I wish I could provide you with a link but found these at our local grocery store. All the kids wanted to bring one home with them. 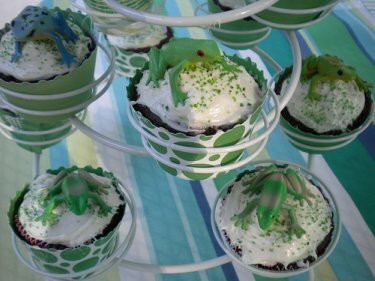 What little guy wouldn't be excited about these frog birthday cupcakes? Not one for making and decorating birthday cakes, I've found that the easiest and most creative birthday cakes are cupcakes. 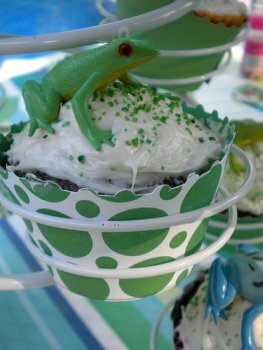 Top your cupcakes with bright lime green frogs and some colored sprinkles for an easy frog birthday cake. Buy your frosting to make it even easier. Cupcakes are much easier to serve and easier to eat than a traditional birthday cake. Display your creative cupcakes on a cupcake stand and use it as your centerpiece. The best size is the one that holds 13. Don't waste your money on expensive cupcake baking cups or liners as most of them lose their color after they've been baked. I made these simple cupcake wrappers before you could find them so readily. The green cupcake wrappers were made from polka dot scrap booking paper and trimmed with a decorative scissor to complete the frog theme. Now you can buy colorful lime green cupcake wrappersto turn ordinary cupcakes into a creative centerpiece. The wrappers provide lots of color and a festive touch to any cupcake. Top your cupcakes with these colorful plastic frogs. They can also be used as little take home party favors as well. Keep it simple by sprinkling a little bit of colored sugar on the cupcakes rather than changing the frosting color with food dye. Make your own frosting or to make things even easier, buy it. I was making my own frosting, but the frosting would kind of melt and drip on a hot summer day out by the pool. I found that the store bought frosting held up better in the heat and looked better. Duncan Hines frosting is our favorite.